SWEAT is a beautiful realization of an ugly reality. It's a human way into a brutally dark corner of the American experience. 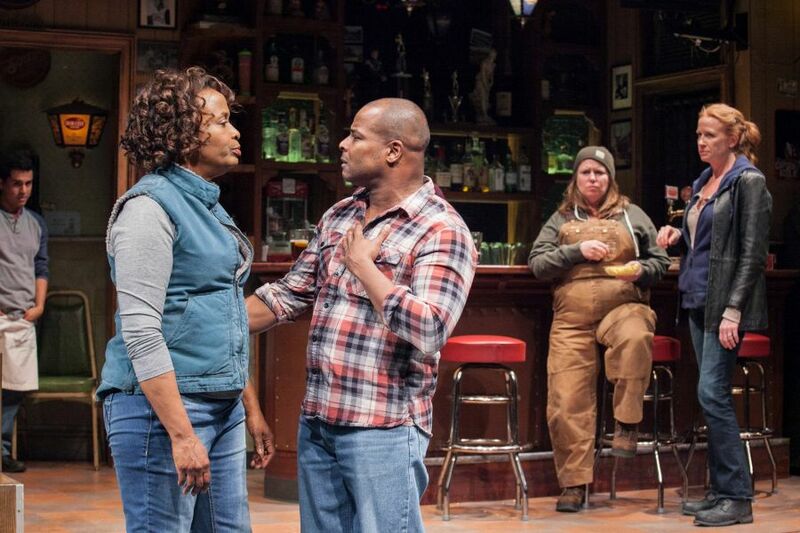 Playwright Lynn Nottage pulls us into the beer-soaked pub that serves as a refuge for blue collar workers in Reading, PA, and thereby draws us into their downward spiraling lives. The content isn't always pretty, but Nottage gives her characters keen senses of humor which translate into moments of audience bliss. We learn at the start that two young men have been charged with a very serious crime—what they did and to whom, is gradually revealed over an eight year period that starts in the year 2000. Flashing back to those earlier years, we meet the Union factory workers who stop by the local watering hole each day after work to gossip and gripe, all while getting their daily fill of alcohol. The workers are played by a versatile cast who make the characters as authentic as people you've known in real life. These are people who know how to smoke a cigarette and drink a longneck, and they may not have seen the best that life has to offer, but they're mostly secure in the knowledge that they'll have a job to go to until it's time to retire. But the onset of tougher times, Union-busting corporate America and cheaper labor across the border, begin to eat away at whatever confidence these workers had, and soon, perhaps, even more will be lost. A lot of these circumstances lead to the kind of misdirected anger at immigrants and others that has become all too familiar in real life over the years. The consequences of fear and anger will be as life-altering as anything that the factory bosses have visited upon their crew. Friendships will be lost, families will be torn apart, and, don't forget, we still need to see what crime those two young men have committed in their rage. Overseeing much of the action is the bartender, Stan (veteran Jack Willis is a solid anchor as both character and actor) who delivers deadpan lines and words of admonition as needed. Actresses Tara Mallen and Kimberly Scott offer deeply moving performances as two women whose personal friendship is pushed to the brink by what happens at the factory, and Stephen Michael Spencer and Tramell Tillman effortlessly take their characters back and forth in time, no small feat considering the before and after elements they go through. One might well think that heavy subject matter dictates a heavy night at the theatre, but not so; the satisfaction of seeing a story so well told is nothing less than exhilarating.